Overlooking the town of Fort William, Ben Nevis is Britain’s highest mountain at 1344 m.
Its summit plateau provides stunning views across the highlands, and can be climbed by the gentle pony track winding up the West flank of the mountain, or for the more adventurous there are scrambles, easy rock routes and superhuman challenges on the 600m North Face of the mountain. As a result approximately 120,000 people reached the summit in 2013! A long standing an infamous race, this annual event is not one for the faint of heart. The race course includes both the uphill and downhill time to run up Britain’s highest mountain. for more info visit http://www.bennevisrace.co.uk/. Ben Nevis is also a seventh heaven for geologists and historians, leading to it being designated a Site of Special Scientific Interest (SSSI). Lochaber Geopark has provided a series of interpretation boards for walkers, helping to explain the complex formation of Ben Nevis and its surrounding area in a simple, engaging and interesting way. Hiking from board to board is a great way to plan a walk as they’re usually located at stunning view points, for more information go to our Rock Routes page. 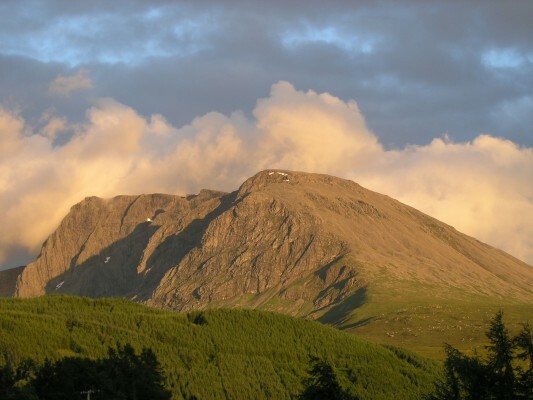 Ben Nevis is a spectacular example of a caldera structure, which occurs when the roof of a volcano collapses into the hollow magma chamber underneath, in the case of Ben Nevis the rocks seen on the North Face fell 600m ! Watch the “Story of Ben Nevis” Video below to learn all about its amazing geological past. Watch Ben Nevis form here. Our video on how Ben Nevis was formed. As well as being a SSSI, Ben Nevis is protected by a variety of other groups, all with a keen interest in preserving the natural beauty of this iconic mountain. The John Muir Trust and The Nevis Partnership are two of the organisations involved in conserving Ben Nevis with path work, litter picks and education. Despite the large number of people who climb Ben Nevis every year, it is still a serious undertaking and people should be well prepared before attempting it. Bring appropriate clothing, know the weather and talk to a ranger at the Glen Nevis visitor center if unsure. Download a copy of the Ben Nevis safety leaflet here.